My best friend from college was in town last week. Her name is Ana and she likes things spicy. Ultimately I though Benny and I would have our act together and make homemade hot sauce for this spice loving friend but time got the best of us and the day of her arrival I found myself at the grocery store loading up on groceries for the coming days. I had recently been gifted with the Rachael Ray Magazine, something I hadn't sifted through myself before. 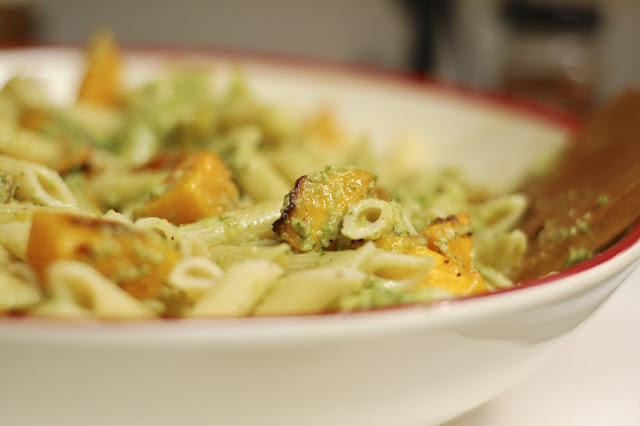 This recipe stood out to me for the love of butternut squash, fresh herbs, and jalapenos. It was delicious. Fresh and flavorful with a kick of spice but not too much. 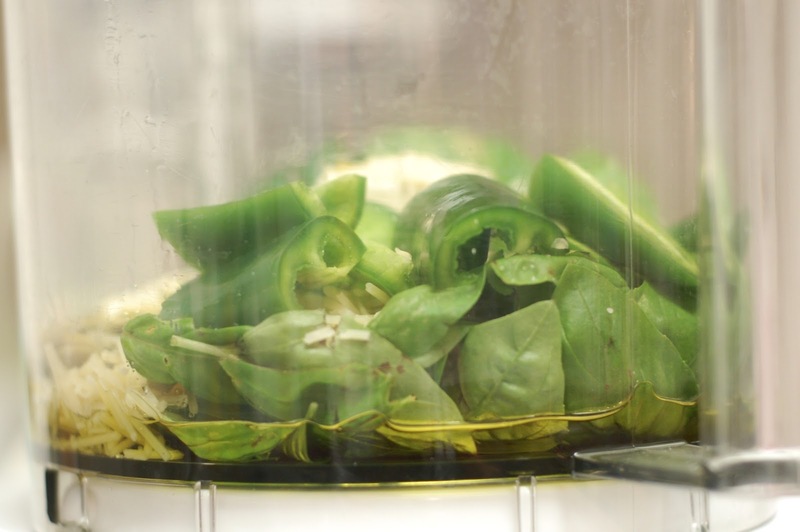 In fact, Anderson even ate it which surprised me given the jalapenos in there. Perhaps he'll take after his father and be asking for hot sauce on just about everything before too long. I'd recommend you make this recipe and file it under a real winner. I wouldn't recommend making it when you're trying to feed your 13 month old but I would deem it tasty enough to serve to guests and something that can easily be dressed up with a fresh salad and bottle of wine. 1 package already cut up butternut squash- next time I'll use 2 packages! 1/3 cup toasted pepitas- pumpkin seeds! 2. Cook your squash while the pasta is cooking on a baking sheet drizzled with olive oil and sprinkled with nutmeg. Cook for 18 minutes. 3. 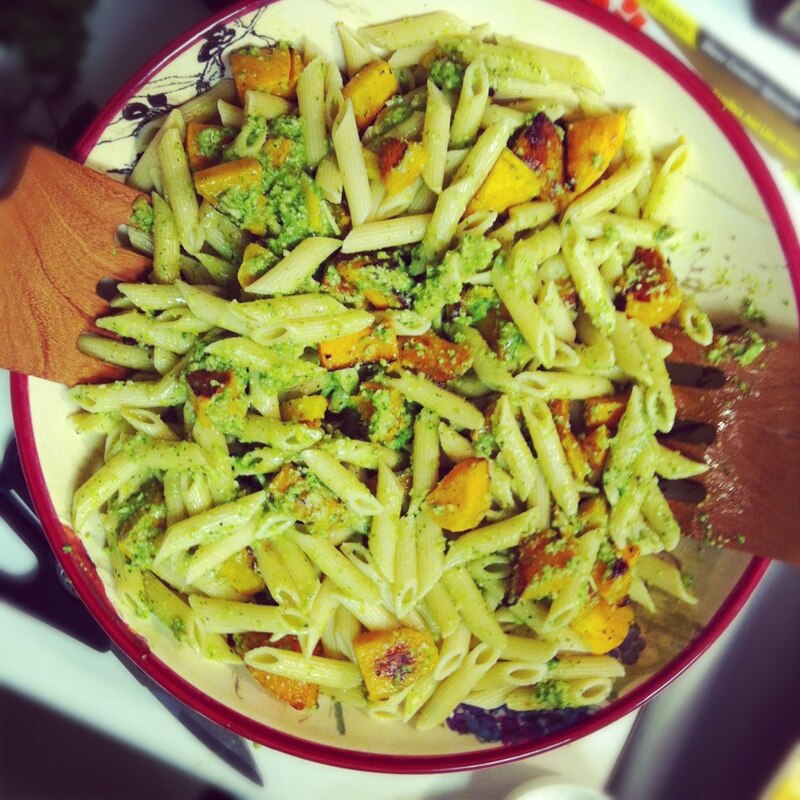 While the pasta is cooking and your squash is roasting combine the oil through lime in a food processor and pulse until is becomes a pesto! 4. When the pasta and squash are done throw them into a large bowl the the pasta water. 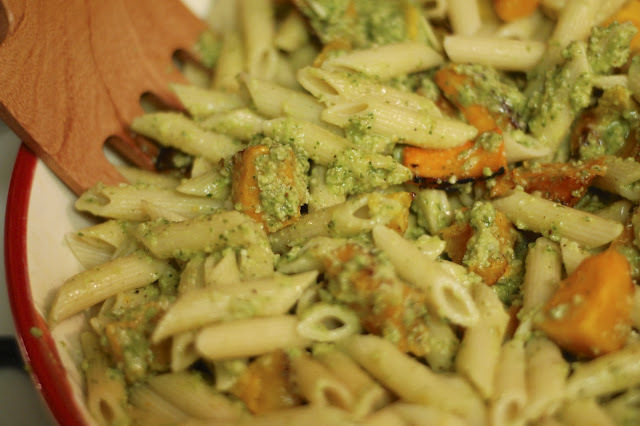 Top with the pesto, stir, and serve immediately. Delicious if I do say so myself. Will you try it? !